To reach Bettie at her home, phone 860-870-7581 and leave a voice message. A list of other Connecticut and other Candle Lighting events can be found on the National Website under News and Events /Worldwide Candle Lighting. Oak Brook, IL—Love doesn’t end with death. Families that have had a child die understand that. 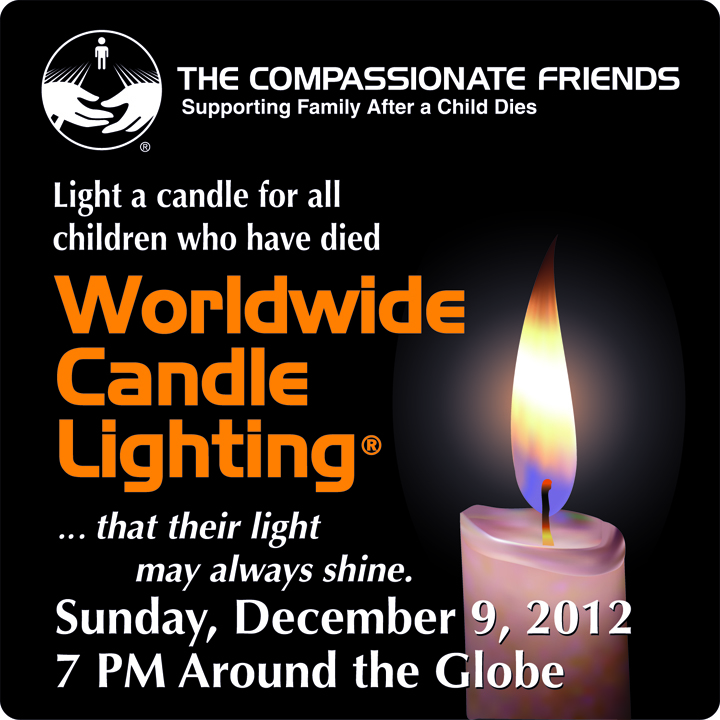 And with that understanding, plans are underway in hundreds of areas across the country, as well as around the globe, for the 16th Compassionate Friends Worldwide Candle Lighting December 09, 2012. 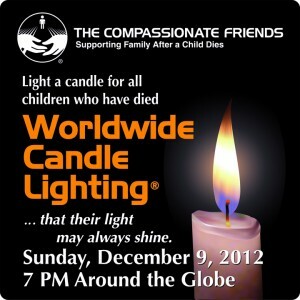 Held annually the second Sunday in December, the Worldwide Candle Lighting unites family and friends who light candles for one hour to honor and remember children who have died from any cause, at any age from pre-birth to full maturity. As candles burn down in one time zone, they are then lit in the next, creating a virtual 24-hour wave of light as the observance continues around the world. All allied organizations, community groups, churches and houses of worship, funeral homes, hospitals, and local community groups are invited to participate. In past years The Compassionate Friends has been joined by chapters from several organizations including, MISS, MADD, Parents of Murdered Children, SIDS Network, Gilda’s Club, and Bereaved Parents of the USA. Services open to the public are held in every state, Washington DC and Puerto Rico, as well as some 15 additional countries around the world. Tens of thousands of families also join in quietly, lighting candles informally in their homes. There is a Remembrance Book on TCF’s national website at www.compassionatefriends.org open the day of the event to receive messages of love. Last year more than 5,000 messages were posted in the short 24 hour-span.